As we pass from mosses to ferns, we see a gradual transition from primitive to modern traits. There are two major trends you should focus on in today's lab. The first is a transition in life cycles, the second is a change in basic internal structure. First, all plants undergo an alternation of generations, between a haploid gametophyte stage and a diploid sporophyte stage. In the most primitive plants, like mosses, the gametophyte is dominant (i.e. it's big and green). In higher plants like ferns and fern allies, the sporophyte stage is dominant. Gametophytes produce gametes (sperm and eggs) in a special structure called a gametangium (-ia), while sporophytes produce spores in a special structure called a sporangium (-ia). Second, all plants need to get water to their cells. Primitive bryophytes like mosses and liverworts are so small that they can rely on diffusion to move water in and out of the plant. Mosses have a few strands of water conducting tissue in their central stem, but nothing like the large and well organized network of tubes in tracheophytes, or "tube plants". The vascular tissues in the more advanced ferns and "fern allies" are made up of xylem and phloem, which conduct water, nutrients, and food throughout the plant body. We'll look at these tissues in a later lab. Bryophytes also need a moist environment to reproduce. Their flagellated sperm must swim through water to reach the egg. So mosses and liverworts are restricted to moist habitats. There are no mosses in the desert. But mosses are surprisingly resistant to drying up, and can survive under very harsh conditions. Mosses are the most abundant plants in both the Arctic and the Antarctic. Asexual reproduction in bryophytes is accomplished by fragmentation or by tiny vegetative "sprouts" called gemmae, which form in special little structures called gemmae cups. Mosses and liverworts are lumped together as bryophytes, plants lacking true vascular tissues, and sharing a number of other primitive traits. They also lack true stems, roots, or leaves, though they have cells that perform these general functions. The leafy green plant that we see when we look at a moss or a liverwort is really the gametophyte, which is the dominant stage in all bryophytes. The sporophytes of bryophytes do not have a free-living existence. They grow directly out of the fertilized egg in the archegonia, and remain dependent on the parent gametophyte for their nutrition. Mosses come in two basic types, a cushiony type, with erect stalks, and a feathery type, which forms flattened mats of low-lying and highly branched moss plants. In both cases, the leafy green gametophytes are dioecious They can be male plants, with antheridia at the top of the plant, or female plants, with archegonia at the top. Remember that these gametophytes are always haploid (1N) plants. Sperm are produced within each antheridium, and an egg in each archegonium. Because the plant is already haploid, these gametes can be created by mitosis, simple cell division. The sperm swims to the archegonia through a thin film of water, drawn by a chemical attractant produced by the female plant, then swims down the neck of the archegonia to the egg. A good morning dew is more than sufficient water for the sperm to swim. Once the sperm enters the archegonia, it fuses with the egg. The 2N zygote develops into a diploid sporophyte plant, a small stalk that grows directly out of the top of the archegonium. This stalk is initially green, and photosynthetic, but later turns brown and becomes essentially a parasite on the female gametophyte. 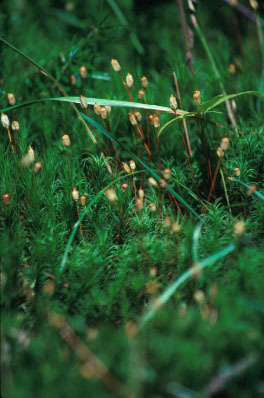 The sporophyte plant consists of a stalk, and a small capsule on the top. Within the capsule, cells undergo meiosis to produce tetrads of haploid spores. When the capsule is ripe, its hinged lid or operculum opens up, and the spores are quickly dispersed by wind and water. The spores germinate into a tiny green thread, which looks like a simple strand of green algae. This similarity is one more clue that bryophytes are descended from green algae. This early threadlike stage is called the protonema (= first thread, plural = protonemata, like stigma/stigmata). The new adult gametophytes grow from a tiny bud that develops on the protonema. Eventually these gametophytes will grow to produce gametes, and the whole cycle will start over again. Mosses can also reproduce asexually by fragmentation or by growing little vegetative buds called gemma, which can break off and grow into a new plant . While bryophytes in general are more interesting than important, in the usual sense, a conspicuous exception are mosses of the genus Sphagnum. Sphagnum moss forms dense mats which become compressed into peat, which can be used as fuel, although it’s very smoky. Peat also contains other plants such as reeds, that grow amid the sphagnum. In dried form, peat moss is remarkably absorbent and, and has been used for diapers, for enriching poor garden soils, and as a field dressing for wounds. Whereas cotton absorbs 4-6 times its dry weight, dried sphagnum can absorb 20 times its own weight in fluids! Peat bogs are very important and interesting ecosystems. Sphagnum mosses greatly increase local acidity by releasing H+ ions, and the pH of peat bogs can drop to 4 or lower, perhaps the most acidic natural environment. Peat bogs cover about 1% of the Earth’s land surface, an area about half the size of the United States. Liverworts share the general properties of bryophytes, but are not very closely related to mosses or hornworts. Many botanists think they may have evolved independently, from a different group of green algae. For one thing, liverworts don’t store food as starch but as oils. If you get the aquatic liverwort Porella in lab, take a sniff of the jar, but not too deep! It smells of rancid oils, oils that went a little funky while the plant was being shipped. Another characteristic unique to liverworts is their lack of stomata, which are found in all other plants, including mosses and hornworts. In many species of liverworts, such as Marchantia, the one you will most likely see in lab, the antheridia and archegonia are not on top of the plant, but hanging down from the underside of odd little structures that look like tiny umbrellas. (These umbrella-shaped structures are called the antheridiophore and archegoniophore). The bi-flagellated sperm swims to the egg, and fertilization takes place to form a diploid (2N) zygote. The tiny diploid sporophytes, which remain attrached to the parent plant, have a very simple structure. Meiosis within the sporophyte produces a number of haploid spores. These spores are surrounded by curious long and twisted moist cells called elaters. When the capsule dries and bursts, the elaters twist and jerk around in a way that scatters the spores in all directions. Liverworts can also reproduce asexually by means of special structures called gemmae cups. These little cups can be easily seen on the surface of the plant. Each gemma cup contains a number of tiny plantlets called gemmae, and a single drop of water will disperse them. These little vegetative “clones” will then grow into a new gametophyte. The green gametophytes of the hornwort look very much like a liverwort. But their small sporophytes more closely resemble those of mosses. The sporophytes grow out of the gametophyte, and look like a little upright horn. Like mosses, hornworts have stomata, and so are probably more closely related to mosses and other plants than to the liverworts they mat resemble. These plants are symbiotic with the cyanobacteria Nostoc. The cyanobacteria fixes nitrogen for the hornwort. Examine the living mosses on display. Notice the small capsules on top of the tiny sporophytes. Mosses generally grow in one of two growth types: cushiony moss and feathery moss. Examine slides of the antheridia and archegonia. The sausage shaped antheridia produce sperm, and the flask shaped archegonia produces eggs. Examine slides of the moss capsule, and identify the spores. Examine slides of the protonema. What type of algae does it remind you of? This resemblance is additional evidence that green algae gave rise to all higher plants. Examine the terrestrial liverworts Marchantia and Conencephalum (one or both should be on display). How does their growth habit differ from that of the mosses? Can you see any gemmae cups on the upper surface of these plants? Examine slides of the liverwort Marchantia. Examine the aquatic liverworts like Porella and Riccia (one or both should be on display). Notice how they differ from the more terrestrial forms of liverwort. Look at the preserved liverworts, and observe their distinct reproductive structures (they look like little green umbrellas). How does their life cycle differ from mosses? Examine slides of the hornwort Anthocerophyta. Know the life cycle of the moss in detail, and be able to recognize the various stages. Hint: Be sure you understand the general life cycle of plants, and can tell which stages are haploid gametophytes (1N) or diploid sporophytes (2N). We'll learn several life cycles in lecture and in lab (moss, fern, pine, flowering plant), but all of them are variations on the same basic theme. Mosses are important in landscaping and gardening, especially peat moss (Sphagnum). Peat moss (Sphagnum) has been used historically as dressings for wounds. Peat moss can be used as fuel. Mosses are the most primitive living land plants. Hornworts contain symbiotic colonies of the cyanobacteria Nostoc. Tracheophytes (vascular plants) completed the conquest of the earth’s surface begun by the more primitive bryophytes. Just as the evolution of spores was the key to the invasion of the land surface by bryophytes, the invention of complex vascular tissues let tracheophytes complete the conquest of dry land. There are about 250,000 species of vascular plants, grouped in nine divisions. Tracheophytes all have a well developed root-shoot system, with highly specialized roots, stems, and leaves, and specialized vascular tissue (xylem and phloem) that function like miniature tubes to conduct food, water, and nutrients throughout the plant. Because ferns and fern allies posses true vascular tissues, they can grow to be much larger and thicker than the bryophytes. The ferns and fern allies (non-seed tracheophytes) mark two major evolutionary strides. In these and in all more advanced plants, the leafy green diploid sporophyte now becomes the dominant stage. The tiny gametophyte may be either autotropophic (like the fern prothallus) or heterotrophic (like the gametophytes of some lycopsids), and is generally free living and independent of the parental sporophyte. Unlike the vascular sporophytes, the gametophytes have no vascular tissue at all. These gametophytes are therefore very small, and develop best in moist areas, where they can absorb water directly from their surroundings. Like the bryophytes, ferns and fern allies are still restricted to moist habitats. Their flagellated sperm need a thin film of water to swim between the antheridium and the archegonium. And when the baby sporophyte grows up from the gametophyte, it is exposed to desiccation (drying up). This basic strategy of a free-swimming sperm and a non-motile egg is shared by plants, animals, and algae. It makes sense, because it means only one set of gametes has to make the perilous journey outside of the organism. The ferns and fern allies germinate from spores. These plants are mostly homosporous - their spores are identical and you can't differentiate which will grow into male or female plants. They are also monoecious - both the archegonia and antheridia (male and female reproductive structures) are borne on the same plant. Contrast these primitive vascular plants with the more advanced seed plants, the gymnosperms and angiosperms, which germinate from seeds rather than from spores. Seed plants are all heterosporous. It is easy to differentiate the larger female megaspore from the smaller male microspore. The sperm of seed plants have no flagella. They lack antheridia, and only a few still have an archegonia. 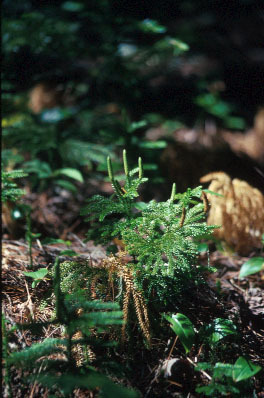 Unlike the more primitive ferns and fern allies, seed plants are mostly dioecious, having separate male and female plants. In many of these primitive plants, certain leaves are specialized for reproduction. These modified leaves, or sporophylls, bear the sporangia at their bases. These sporophylls usually branch out from a shortened stem, forming a club shaped structure called a strobilus. The pine cone and the flower are elaborate variations on these primitive strobili. There are four divisions of non-seed tracheophytes, vascular plants that reproduce by means of spores, the Psilophyta, Lycophyta, Sphenophyta, and Pterophyta. Before these non-seed tracheophytes evolved, the bryophytes were the dominant form of plant life. The evolutionary edge of having a more efficient conducting system, and a well-developed root-shoot system enabled them to outcompete bryophytes. If you’re lucky enough to see ground pine or other club mosses growing in the shade of a large pine tree, think for a moment about how these tiny plants were once the masters of the planet, forming vast forests with trunks from 20 to 100 feet tall! There are only two living genera of whisk ferns, sole survivors of a large and widespread group of early land plants. In addition to the living Division Psilophyta, the psilopsids, there are two extinct divisions of primeval vascular plants. 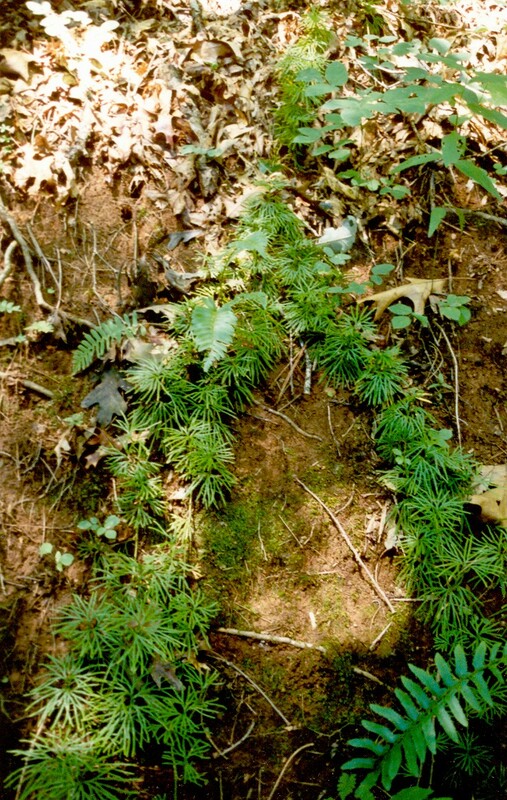 The primitive whisk ferns resemble these extinct pioneers in many ways. They are the only living vascular plants that lack a root-shoot system, a characteristic they share with both extinct Divisions of ancestral vascular plants. Some recent molecular evidence suggests that one, or even both, of the living genera of psilopsids may actually be more closely related to ferns, like a fern that has reverted to more primitive traits. If this is true, then Psilophyta will join the ranks of the numerous extinct Divisions of plants. Psilopsids are found in tropical and subtropical areas, and occurs throughout the southern US. I once found one growing on my back porch under the leaves of a spider plant. Whisk ferns are a common weed in greenhouses all over the world. They are simple green upright stems, with dichotomous branching. They have no leaves, and no true roots. The outer tissues of the stem do all the photosynthesizing. A portion of the stem called a rhizome runs along the ground, or just below it. A rhizome is a horizontal stem that spreads the plant around. Roots grow out the bottom of the rhizome, and a new plant can arise at the same point from the top. The green stem-like plant is the diploid sporophyte, the dominant stage in the life cycle. In the small sporangia (bright yellow) that form along the upper stems, the spore mother cell forms haploid spores by meiosis. Their gametophytes are tiny little thread-like underground plants that lack chlorophyll, and live as heterotrophs in the soil, looking and acting much like a tiny fungi. It actually contains a symbiotic fungi, the same mycorrhizae that live in the rhizomes of the adult sporophyte. Their are only five living genera of lycopsids, but at one time from the distant Devonian, about 400 mya, well into the Carboniferous, they were the dominant form of vegetation on the face of the Earth. Now they are reduced to a shadow of their glorious past, inconspicuous little plants in the forest understory. The tropical species are small epiphytes (plants that grow on other plants). Their roots grow from special underground stems called rhizomes, as do most of these primitive tracheophytes. In some species the sporophylls are mixed in with the scale-like leaves. 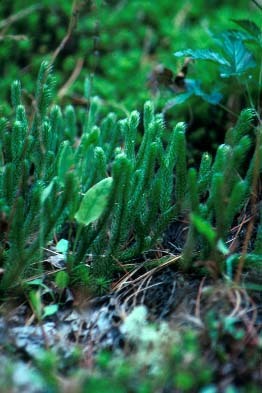 In many species, the sporophylls are organized into strobili, hence the common name of “club moss”. The sperm swim down the strobilus to the archegonia, and the zygote that forms is retained in the cone, which ripens and falls to the ground. The gametophytes are independent and free-living, They are curious creatures that look and act nothing like their sporophyte parents. They can be either heterotrophic or autotrophic, and usually have a symbiotic fungi associated with them. Many of the lycopsids are heterosporous. Selaginella is a good example of a heterosporous plant. In waste places, disturbed areas like trails and railroad beds, and in odd corners of fields and forests you might find another small plant quietly dreaming of its former splendor, the horsetail. Horsetails appeared in the late Devonian, and were among the dominant forest trees for hundreds of millions of years. Only one genus of Sphenophyta still exists, the genus Equisetum, and it may be the oldest living genus of plants on earth. Horsetails towered among the Carboniferous forests, reaching heights of 30-60 feet. Much of the coal deposits we exploit for fuel today were formed from horsetails and other trees during the Carboniferous, toward the end of the Paleozoic. Horsetails have true roots, stems, and leaves, though the leaves are little more than flattened stems. Their hollow, ribbed stems are jointed, kind of like a stalk of bamboo, and a whorl of leaves arises at each joint. The plants are spread vegetatively by rhizomes. The stems feel very rough, because the epidermal tissues are impregnated with tiny grains of silica (sand). This probably helps protect the plant against herbivores. These rough stems made this plant ideal for pioneer women to use for scrubbing pots and pans, hence its other common name, “scouring rush”. The green plant we see is the diploid sporophyte generation. The stalks can be highly branched vegetative stalks, which actually look like horse tails, or straight unbranched reproductive stalks, which are tipped with a large strobilus containing the sporangia. The homosporous spores develop into a teeny-tiny green gametophyte, just a few mm long, that looks like the gametophyte of a fern. The gametophyte is haploid, free-living, and autotrophic. Ferns probably evolved from the psilopsids, sometime in the Devonian, relatively early on in land plant evolution. They are very abundant and diverse, ranging in size from a single centimeter to trees 24 meters tall with 5 meter fronds. Ferns have been better competitors with seed plants than other seedless vascular plants, and are a conspicuous part of the landscape throughout the world, but especially in the tropics, where 75% of their 12,000 species occur. Ferns are relatively advanced plants, with true roots, stems and leaves. The blade of the fern is called a frond, and the little individual leaflets are called pinnae. Ferns have true leaves, what botanists call macrophylls. While the leaves of more primitive plants, which are called microphylls, are simply extensions of the epidermis of the stem, the leaves of ferns and higher plants were formed as a web of tissue stretched between small terminal branches. The leaves of higher plants, as well as the modified leaves that make up the pine cone and the flower. The life cycle of the fern is typical of other non-seed vascular plants. The leafy green plant is the sporophyte. Fertile fronds develops clusters of small sporangia on the underside of the frond. These clusters of sporangia are called sori (sing. sorus). Sori are often protected by a tiny umbrella-like cap called an indusium (-ia). 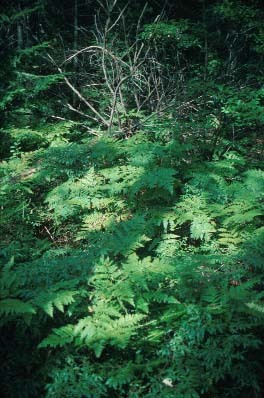 Ferns are mostly homosporous, though some are heterosporous. The heterosporous state is a more advanced condition, that seems to have evolved independently in several groups of plants. The haploid spores are formed by meiosis inside the sporangium. They are ejected in a miniature explosion caused by the unequal drying of the alternate thick and thin-walled cells that line the outer surface. The top pulls slowly back until it reaches a critical point and then snaps forward at an incredible speed. At that size scale, the expulsion of fern spores is one of the most explosive events in nature. The spores germinate into tiny gametophytes. The little heart shaped gametophyte is called a prothallus, literally “first-body” (pl prothalli). the prothallus has no vascular tissue. Its small size lets it rely entirely on diffusion. Its tiny rhizoids are associated with mycorrhizal fungi. The little prothallus is green, and photosynthetic, and bears either antheridia and archegonia, or sometimes both together, on its upper surface (lab slides have both on same prothallus). The archegonia are always found at the arch of the heart, and the antheridia are tucked away among the tiny rhizoids at the other end. The sperm swims to the egg to fuse into a diploid zygote. The new sporophyte grows directly out of the top of the gametophyte. When it first begins to uncurl, the frond looks like the scrolled neck of a violin or fiddle, and this stage of development is called a fiddlehead. Examine the living lycopsids on display. Why are they called club mosses? Notice that quillworts and Selaginella are very different in appearance from the club mosses. Examine slides of Selaginella's strobilus. Identify megaspores and microspores. Examine the living horsetails on display. Notice the prominent strobili of the reproductive stalks, and the bushy growth form of the vegetative stalks (if available). Examine the living whisk ferns on display. Psilopsids have a simple dichotomous branching pattern. You may see tiny yellow sporangia on the branches. Whisk ferns lack strobili. These primitive plants are closely related to ferns. Examine the living ferns on display. Can you see any fiddleheads? Look for the rhizomes. Rhizomes are modified horizontal stems bearing roots, that run along or just underneath the ground, and spread ferns and fern allies around. Examine the living fern prothallus on display under a dissecting microscope. Note its characteristic heart shape. Some prothalli may have a tiny new fern emerging from the notch of the "arch" heart, where the archegonia are located. Examine slides of the prothallus: Find the archegonia (can you see an egg?). Examine the fern leaflet on display under the dissecting microscope. Notice the prominent indusia, and the small sporangia peeking out from beneath. You'll see a few groups of sporangia that have lost their indusium. If you're lucky, as the heat of the microscope dries out the leaflet, you might see the sporangia eject its spores. But don't blink - it's one of the fastest and most explosive acts in nature. Use high power to observe the spores. Examine slides of the sori and indusia; use high power to observe the spores. Know the life cycle of the fern. Recognize specimens and slides of the various stages. Ferns and fern allies are primarily responsible for our modern deposits of coal. The fiddleheads of some species of ferns are edible. Ferns are important for the florist, gardening and landscape industries. Why are all these plants restricted to wet habitats? Why is the epidermis of the horsetail so rough? What does it need protection from? All of the fern allies in this lab once towered 50-100 feet or more. What happened?